Every year, starting when I was six, my family spent a week in a cottage on Lake Winnipesaukee in New Hampshire. This was a special treat for everyone in my family. My parents were second-generation Americans (more or less). Their grandparents had come to this country from Germany, Ireland and Scotland in the late 1800s. My parents had grown up in the rented halves of two-family homes in Bridgeport, Connecticut. And when they were teenagers, the Depression started. So the only family vacations they ever took were to visit relatives. They married during World War II. And when my father came back from the war, they had to live with my grandparents in half of a two-family house. Plus my teenaged aunt Merilu lived there AND my Aunt Margaret AND my Uncle Joe AND their baby Laurel. In case you lost count there, that's 6 adults, one teenager and one baby in 5 rooms on the first floor and 2 in the attic, and one bathroom. So when, 10 years later, my parents owned a one family house in a nice suburb of Bridgeport AND could afford to take a vacation, it was quite a treat for them. My brother and I didn't appreciate any of that. 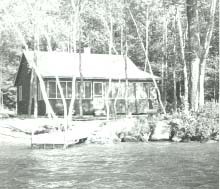 We thought the cottage was great because it was right on the lake, with a beach and a dock. We could swim and fish and go out in the rowboat. AND there were woods on both sides of the cottage and behind it too. Even that first year, though, I think we realized that it was a very beautiful place. The cottage was on a cove about a half mile wide. The other side of the cove was an evergreen peninsula. If you stood on the end of the dock. you could see the end of that peninsula where there were 2 tiny islands, the larger was almost completely covered by a house. And just to the right of those islands was where the loons hung out at dusk, singing their wild song and dancing just above the water as they landed and flew away. One afternoon, when everyone else was outside, I became fascinated, absolutely fascinated, with the lock on the bathroom door. Now you're probably wondering, why anyone, even a six year old, ESPECIALLY a six year old, would be fascinated with a lock on a bathroom door. Remember me mentioning my brother? He's 3 years older than I am. And at the time, one of the things he LOVED to do, while I was taking a shower a night, was to quietly open the bathroom door, and turn out the light, and listen to me shriek. So I knew very well how the lock on the bathroom door back home worked. It was a dead bolt lock, you turned the knob, and the hasp went into the door jab. And you turned the knob the other way to unlock the door. However, the lock on the bathroom door in the cottage was completely different. You closed the door, then pushed in a button in the middle of the door knob. To unlock the door, you had to turn the door knob very hard. So I practiced this a while. And then I became curious. I wondered if, while the door were open, you pushed in the button, and THEN closed the door - would the door be locked, or would closing the door have unlocked it somehow? So I decided to conduct an experiment. And I decided that in order to be completely sure whether the door was locked or not, I had to close the door while standing in the hall. If I were standing inside the bathroom, I might not be able to tell. From the inside, all you had to do was turn the knob hard enough and the door would unlock. So I conducted my experiment. With the door open, I pushed in the push button, then backed into the hall and closed the door. I tried the doorknob and discovered that the door was locked. AND THEN I REALIZED THAT THE DOOR, THE ONLY DOOR TO THE BATHROOM, WAS LOCKED! WHY DIDN'T I THINK AHEAD A LITTLE BIT? I decided to hide for a while. But then all the guilt and anxiety built up in me, and I went to find my father. Now, usually in my father's eyes, I could do no wrong. For example, earlier that summer, my mother called my father at work. "Kenny, you're going to have to stop at the hardware store on your way home. One of the kids broke the glass in the storm door." "Oh, just wait till I get home. Kim will never do that again." "No, Kenny, it wasn't Kim, it was Kate." "Ah, er, ah, I accidently locked us out of the bathroom..."
"How did you do THAT ???" "Ah, I was just trying to figure out how it worked..."
"This is a big problem, young lady!" "Yeah, I know. I didn't _mean_ to do it..."
My father was upset for another reason - the bathroom window was only 12" wide. He couldn't fit through it, my mother couldn't. My father decided that I should be pushed through the window. As he was pushing me through feet first, I cried, "Don't push so fast! I can't get my foot on the toilet - I'm going to fall all the way down to the floor!!!" "I don't care, young lady, just get in there and open that door!" So I survived that fall of three feet. As I was opening the door, my father was putting the screen back on the window. End of my FIRST experiment with the lock on the bathroom door. O I decided to conduct another experiment. I got a chair to stand on so I could reach that key. And then, with the door OPEN, (I had learned something from my previous experiment), I pushed the push button in, inserted the key into the hole, and unlocked the door. It's been almost 40 years since I conducted my experiments on the lock on the bathroom door in the cottage on Lake Winnipesaukee. As you can tell, I have never forgotten how that lock worked. In fact when I see that kind of lock, I laugh, and then hope that no one saw me laughing at a door. I don't know that my parents ever laughed when they saw that kind of lock, but I think that lock was always a part of my parents' memories of their first family vacation.